Trelleborg, global provider of engineered polymer solutions, has hailed the recent successful test of the Universal Transfer System (UTS) conducted with Connect LNG and Gas Natural Fenosa, as tangible evidence of the new applications that its suite of products for jettyless LNG transfer can unlock in this challenging field. 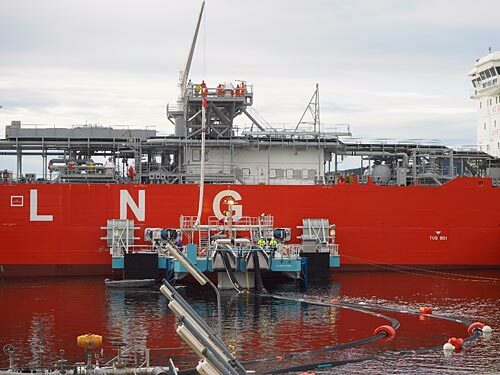 The UTS transferred LNG from the Skangas-chartered LNG carrier Coral Energy to the onshore terminal at the Norwegian port of Herøya on October 7 and is now in full commercial operation. A “plug and play” solution, the UTS requires no modifications to the LNG carrier – instead, the platform maneuvers offshore to meet a vessel, removing the need for costly and environmentally intensive dedicated small/medium-scale LNG vessel harbor and jetty structures. The system consists of Trelleborg’s Cryoline LNG hoses, attached to a floating platform, which incorporates Trelleborg’s ship-shore link technology and a selection of its marine fender systems. 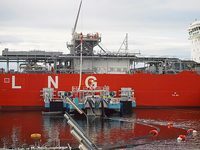 The UTS increases the operability of an LNG terminal, as the hose and platform can be retracted when not needed, or when harsh weather conditions would present hazards. The platform-based solution can either function as a standalone unit, or enhance a larger terminal’s ability to handle deliveries to and from a broader range of vessels. Trelleborg service engineers were present during the first commercial LNG transfer of 400 m3, and will support further commissioning operations. A range of Trelleborg technologies make this new model of LNG transfer possible. Cryoline is the first floating hose of its kind to receive the coveted EN1474-2 accreditation, using flexible rubber-bonded hose technology to minimise boil-off and withstand fatigue harsh environmental conditions. Extra safety is provided by an integrated monitoring system using fiber-optic technology. Trelleborg also supplied its USL 8810 to monitor the LNG transfer process. A triple fibre-optic, five pin SIGTTO and pneumatic system was supplied to ensure all round flexibility for the platform for any visiting vessel. Trelleborg’s Sea Guard fenders were specified for use at the front of the UTS to absorb berthing impact against the larger LNG vessel prior to attachment to the vessel. While to reduce the impact of the tug vessels on the UTS, Trelleborg’s Super Cone (SCN) fenders were specified to enable the tugs to safely push the UTS from shore into position for transfer operations.